A large 2 TB capacity drive in a small 2.5 inch form factor makes these drives ideal for small HTPC systems. 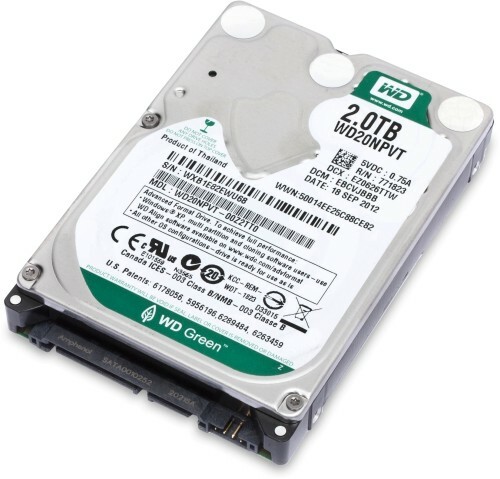 Western Digital Green hard drives are designed for use in systems that require cool and quiet operation, as secondary drives in PCs, for external enclosures and other applications for which low noise and low heat are beneficial. These environmentally friendly 2.5" hard drives are ideal for use whenever energy efficiency is needed. This drive features NoTouch Ramp Load technology which ensures that recording head never touches the disk media ensuring significantly less wear to the recording head and media as well as better drive protection in transit. IntelliSeek calculates optimum seek speeds to lower power consumption, noise and vibration. Upgrading your drive is easy with WD Acronis TrueImage and this is available as a free download on the Western Digital Support site. It enables you to copy all your data to a new drive so you don't have to reinstall your operating system to get all the benefits of the new drive. Note: Although it is only a 2.5" drive it is 15mm thick and therefore is too large to fit into laptops/notebooks.